Boomerang begins documentary style with a voice-of-god narration. 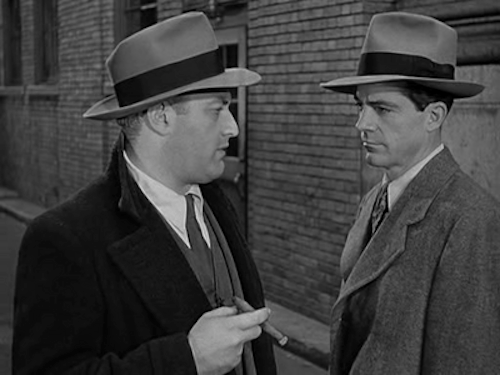 For film noir, I tend to prefer straight drama over procedurals. This film combines some of both with moderate success, aided by Norbert Brodine’s black-and-white cinematography. A popular priest gets gunned down in the street, baffling police. After a massive dragnet, they find someone to pin it on (Arthur Kennedy). 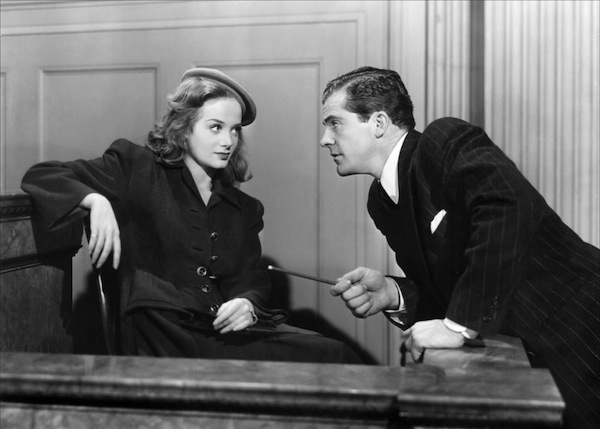 Dana Andrews stars as State’s Attorney Henry L. Harvey. Henry has a rich wife (Jane Wyatt) and enough ambition to take them to the Connecticut governor’s mansion. What he didn’t count on was a case that could end his career. Lee J. Cobb plays police chief “Robbie” Robinson, an ally of Henry’s who becomes an adversary. With all of director Elia Kazan’s films from the postwar era including On the Waterfront (1954), we get mixed signals and ambiguity. Is it possible to look at them purely on their dramatic content? Yes, but it’s difficult when so many have a subtext that reminds us of the Blacklist. Kazan was a “friendly” witness who “named names” before HUAC as did Lee J. Cobb. They kept their careers but lost friends because of it, starting with those they named. When Kazan was given an honorary Oscar in 1999, some in the audience including Warren Beatty [Splendor in the Grass (1961)] stood and cheered. Others weren’t so forgiving and just sat there as protestors demonstrated outside. On a lighter note, it’s amusing to see the film noir past of 1960s TV star Cara Williams (Pete and Gladys, The Cara Williams Show). She plays Irene, a spurned lover who could offer an alibi but would just as soon see the condemned man hang. Nice one, Gladys! 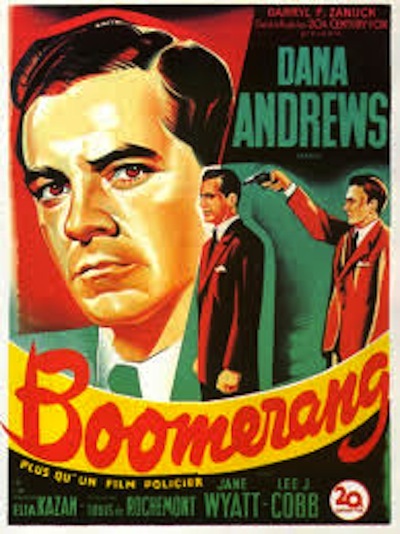 This entry was posted in Events, Movies and tagged Boomerang, Cara Williams, Dana Andrews, Elia Kazan by crimsonkay. Bookmark the permalink.